The Iraqis voted yesterday, and, in spite of all the nay-sayers and the increasingly desperate 'insurgency', the election went ahead smoothly. 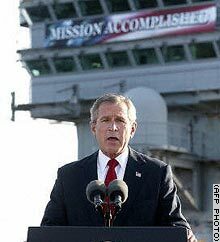 Now that is what I call 'Mission Accomplished'! Please take a moment to look at Smash's photo essay of what the event means to him. I'll update this post with additional links as I find them. What was the cover story of the Village Voice I saw in the library today? “Bush’s plan to destroy the world.” Destroy it some more, George. Absolutely. I'll take Bush's method of destruction over Saddam Hussein's any day. And one of the signs that the times are changing: An Israeli Jew of Iraqi descent presented the proper paperwork in Jordan, and voted.